> Recipes>Squacquerone> Squacquerone of Romagna dop ,smoked salmon and courgette. Squacquerone of Romagna dop ,smoked salmon and courgette. 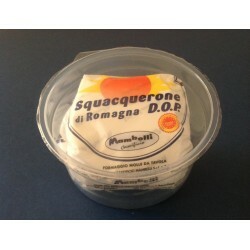 200 g Squacquerone of Romagna dop. 4 slices of smoked salmon. 1 spoon of green lemon juice. 1/2 spoon of soy sauce. Wash the courgette and grate it in a bowl without peeling it. Pour the green lemon juice. Add dry ginger chopped into little pieces, rice and soy sauce mixed with a pinch of wasabi. Cover with film and let it marinating in the fridge for at least 1 h.
Lay a slice of salmon on a big plate. Sprinkle with Squacquerone of Romagna dop, then add, some cm. from the border, along the entire lenght, 1/4 of the courgette mixture. 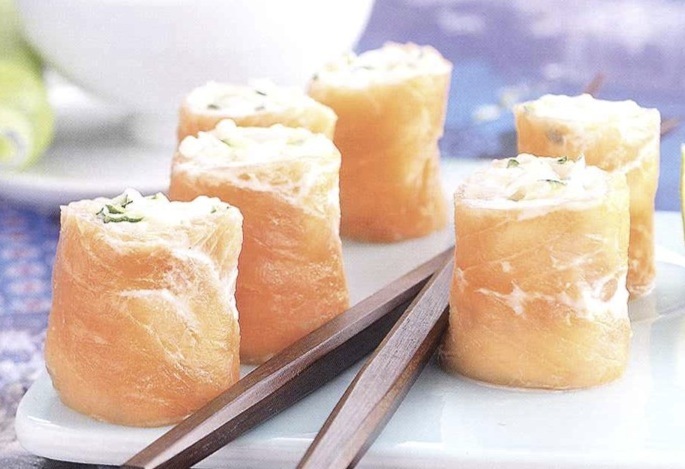 Roll a slice of salmon into a tigh roll. Cover with the film and store in the fridge. Prepare the others rolls in the same way. When you will serve, remove the film and, with the aid of a knife cut little pieces long 3-4 cm. Lay them vertically on a plate. Taste them as aperitif, serving them with soy sauce in which you will add a bit of lemon juice and a pinch of wasabi.